George Graham Reviews Amy Rigby's "Little Fugitive"
The witty singer-songwriter, who creates songs that are amusing or particularly clever is a long-running tradition especially in jazz and folk, though for some reason, less so in rock. This week, we have the latest recording by a particularly astute and creative practitioner of the art, who does approach the concept from a more rock-oriented perspective. She is Amy Rigby, and her new CD, her fourth of new material, is called Little Fugitive. It was in 1997 that Ms. Rigby's debut solo recording, Diary of a Mod Housewife, produced by Elliot Easton of the Cars, appeared to considerable critical praise. But before that, the Pittsburgh native had been part of a band called Last Roundup, a kind of cow-punk outfit from New York in which she played rhythm guitar. Then she attracted attention as a member of a folk-pop trio called the Shams before Diary of a Mod Housewife emerged, full of clever writing based on events she saw around her, clothed in attractive pop arrangements. She followed that in 1999 with Middlescence, and that led to touring with Warren Zevon and the Lilith Fair series. She moved to Nashville by 2000, where she recorded Sugar Tree, with musicians from the area, though not a great deal of country twang. Now she returned to Brooklyn to record Little Fugitive, which was done in only two days, and then mixed by Don Dixon, a prominent figure in the 1980s power pop scene from North Carolina. And for me, Little Fugitive is some of Ms. Rigby's best work, and the most downright witty. She takes up the problems of modern life and relationships, along with some classic dilemmas, and weaves them into memorable songs that manage to caste new light on the subject matter, even when the songs are funny, all the while maintaining a great catchy pop sensibility. She is joined by a tight little band who adapt to the widely varying musical moods of the songs, and also do some great retro re-creations, hinting at music from the 1960s and up. They include guitarist Joe Graboff, who co-produced the CD with Ms. Rigby, keyboard man Joe McGinty, bassist John Conte and drummer Dennis Diken. Like the best of the witty lyricists, Ms. Rigby can also get a point across with her words. They are not just amusing for their own sake. 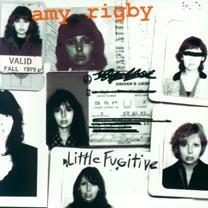 Amy Rigby's new album Little Fugitive is on the par with her impressive debut CD. The "mod housewife" who, by the way, has lectured at music conferences on "rock parenting," has created a gem of an album that features great wit chock full of memorable lines, along with an attractive rock and pop backing. She is one of those songwriters who can look at the same subjects that have motivated composers for many decades, and can give them a clever new spin. The songs are made more fun by the distinctly retro backing, often light-hearted in sound. Our audio quality grade is a B-plus. This is a rock album and sounds it, with not a great deal of sonic subtlety, but everything has decent clarity. The acoustic instruments sound like acoustic instruments, and Ms. Rigby's vocal is handled with a minimum of effects. Amy Rigby is clever, smart and very witty on her new CD. And she also rocks. Who could ask for more?